Wake up to our breakfast celebration with a farm-to-table feast. On cool mornings, don a comfortable sweater for breakfast by the creek with birds and brook singing. For early risers, the electric teapot is ready to turn on for your French press coffee. Pick out a teapot to brew herbal or English breakfast blend. We let you be self-serve on beverages and select your preferred time and table for breakfast. You have already let us know what you prefer not to eat, so we will be creative with all the other options available. We offer vegan, gluten-free and vegetarian meals upon request. Please let us know your preference when you make your reservation. Our most famous entree is our own recipe for sausage roll, a pastry delight stuffed with local sausage, cream cheese, and apple or sweet potato butter and baked with cinnamon, ginger and cloves. Our chef Janice has studied at the Santa Fe School of Cooking in New Mexico, so a southwest flair may surprise you, but the food always reflects a gathering of local produce, much from our local orchard and vegetable barn, Carver’s Orchard, just 2 miles down the road, if not from the garden. Fresh organic herbs are always available in the window boxes for garnishing. Don’t be surprised if you experience an original dish created just for you,mixed in with the favorites such as steaming hot strawberry crepes or Janice’s family sweet roll recipe full of cinnamon swirls. Summer breakfasts are usually served outdoors on the porches. A private table may always be requested. Interning chefs bring new ideas to the inn and continue the delight in combining the best of nature’s playground in the kitchen and on the trails. Original recipes always available by request. No secrets, just a fun, learning, sharing kitchen. 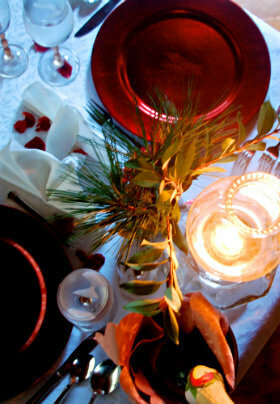 Dining at Creekwalk Inn at Whisperwood Farm is a one-of-a-kind experience at your own private table by lantern light. We have craft beers, homemade Kombucha and menus that are either planned with you or spontaneous at the chef’s whim. 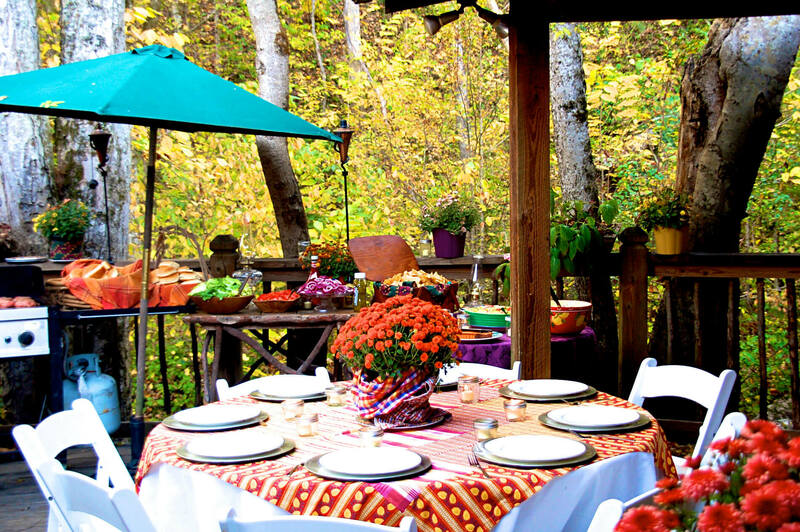 We will surprise you with delectable appetizers, salads, and entrees that debut at the farm. Pasta with homemade marinara sauce, steaks, blackened chicken, fresh-caught trout smoked over hickory and oak, grilled Poblano peppers stuffed with sausage and organic cheese,homemade bread and desserts from heaven,just a few of the slow food ideas that inspire memories and conversations you will treasure forever. Then slip away to your comfortable room for a beautiful night’s sleep. Our steaks are marinated and prepared over an open flame, seafood grilled or blackened, our vegetables always fresh and lightly steamed or baked. Bring your own favorite wines to pair with each course, or ask our chef for suggestions. All dining is by reservation. 7-Course Dinner, $49 per person (steaks, $11 extra), plus tax and service fee. Open menu unless reserved at least 7 days in advance. Reservations required 48 hours ahead please, although we will always try to accommodate you if possible with shorter notice. For dinner choices request fresh trout from our local trout farm or our smoked trout grits layered with roasted tomatoes and zucchini. 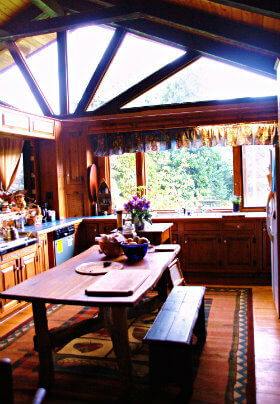 The wood-fired oven in the kitchen smokes roasts or sauces with a true Smoky Mountain bed and breakfast flair. Simple hiking lunches make your time in the woods or on a mountaintop more fun. We pack wildflower honey and nut spread sandwiches with fruit, you bring the water from our well. We have day packs to share.